Copperhead Salon is a unique and personalized salon experience in a family friendly atmosphere. Chris Martin, the owner of Copperhead Salon, has been a proud sponsor and official stylist for the Miss America , Miss America Outstanding Teen and Miss FL America pageants since 2004. We also sponsor all local Orlando title holders. We love being a part of our local community and giving back. Children's Miracle Network, Ronald McDonald House are a few organizations we contribute to. The Salon also offers free wig trims and adjustments for anyone going through cancer treatment or other medical reasons for hair loss. 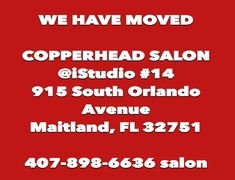 We are located within IStudio Maitland #14. You can find IStudio within the Villages of Lake Lily next to Teak restaurant. 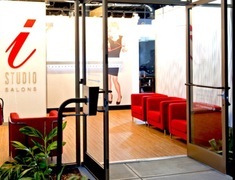 Please treat yourself to a hair experience like no other and come join our family at Copperhead Salon. We promise high end service minus the pretentious attitude. Our love for our clients and family-like atmosphere brings out the best in each stylist to cultivate the perfect look for every individual. Feel free to stop by and take a peek.